New issue of What Hi-Fi? magazine on sale now | What Hi-Fi? Despite the arrival of digital music in the form of CD, and more recently streaming services, the vinyl record has refused to go away. 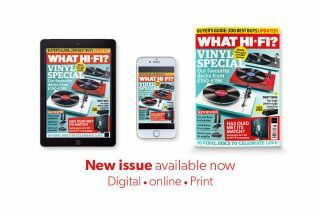 The May issue of What Hi-Fi?, available on the newsstands today, takes a look at this most resilient format, testing some of the best turntables you can buy, and giving you our pick of the best decks ranging from £150 to just under £20,000. We also review the best phono stages on the market, pick our favourite turntables of all time, and look back to where it all began for some of the most famous turntable brands. But it's not all record-related, we also reveal how Samsung’s new stunning 4K TV could take on OLED TVs at their own game, see new speakers from Revel and Wharfedale, hear amps from Denon and Yamaha, plus plenty more besides. Even five years ago, no one could have imagined that in 2019, we’d be celebrating all that's good about records with a vinyl special magazine. Yet, having almost been killed off in the 1990s and 2000s, the thin black disc has found a whole new lease of life. Our round-up features six Award-winners among the 15 turntables – and with prices ranging from £150 to almost £20,000, there’s something here for everyone. Vinyl lovers have never been better catered for, so whether you’re in the market for a first deck, thinking about upgrading or just wanting to know what's out there, let’s rejoice in vinyl’s second coming. Already chosen a record player, and wondering how to integrate it into your system? We’ve outlined three of the best set-ups, ranging from a simple plug-and-play budget system to one with some serious hi-fi kit. And if you’re planning on matching your deck with an amp, you’ll need a phono stage. In this special issue, we also review the 11 best phono stages and tell you which ones will really allow your LPs to sing. As if that wasn’t enough, we rate the best turntables of our lifetime – the 15 best decks we’ve seen since What Hi-Fi? was first published 43 years ago. In our Insider section, we speak to Geoff Pesche, Mastering Engineer at London's famous Abbey Road Studios, about cutting some of the best selling tracks of all time to vinyl, including New Order’s Blue Monday. Valentine’s Day may have passed, but don’t miss our feature on 10 vinyl discs that celebrate love. Struggling for words to tell your loved one how you feel, then why not say it with vinyl instead? The May issue of What Hi-Fi? has some tips. Also, don't miss the second part of our special two-part feature, as we delve back into the archives to discover the debut speakers from some iconic manufacturers. In our First Tests section, you’ll find reviews of all the latest hi-fi kit, including the Samsung QE65Q90R television, the company's first 2019 4K TV. With a brighter, punchier picture and better viewing angles, we think it’s the “best backlit set we’ve ever tested”. Could this QLED TV be ready to take on its OLED rivals at their own game? We also review two pairs of speakers in the Revel Concerta2 F35 and Wharfedale D310, along with two amplifiers, Denon’s AVR-X4500H AV amp and Yamaha’s A-S301 stereo amplifier, and the Pro-Ject Pre Box S2 Digital DAC. There’s also a review of the Astell & Kern A&futura SE100 portable music player, the Amazon Echo Input smart assistant, which brings Alexa control to your existing hi-fi speakers and, finally, the Audio-Technica ATH-M50xBT headphones. In our Temptations section this month, we feature the Chord Hugo TT2 DAC and the Aurender S5W speakers – so if you’ve ever wondered what nearly £7,000 worth of hi-fi kit sounds like, now’s your opportunity to find out. There’s also our Buyer’s Guide, a definitive list of all the best home entertainment kit you can buy. If you’re looking to buy anything from a pair of wireless headphones to a speaker package, a soundbar to a DAC, this section will tell you where to spend your money wisely. Plus: Don’t miss our special subscription offer – a free pair of SoundMagic E11C in-ear headphones (worth £50) when you subscribe to What Hi-Fi?. The May issue is not to be missed. So grab your copy of What Hi-Fi? on sale today. Or download it to your tablet or smartphone instead. Enjoy!